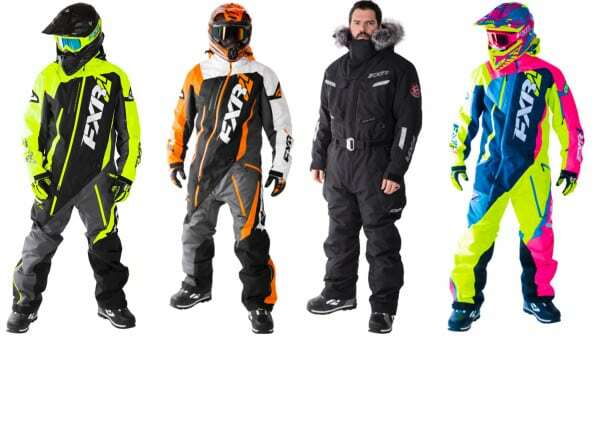 No matter what you call them, the “old school” one-piece snowmobile suit is making a strong come back in a modern way. For sure several of the aftermarket clothing companies have dabbled in the “onesie” for the past several years, with the kids at HMK jogging our memory banks as one of the first to bring the full zipper suit back from the dead. But fast forward to 2017 and no one is making a stronger push for the head to toe gear stronger or better than the crew at FXR. Dubbed the Monosuit, the FXR offers are many and dare we say extremely colorful is you so choose. From the Maverick to the Squadron to the Ranger and our favorite the throw back Svalbard version, there is likely a Monosuit in their lineup that will fit your style, both in terms of fashion and riding. To be honest we were hesitant at first to give the onesie a try in modern form. After-all our curmudgeon editor Bourgeois had forced us from time to time to suit up in some of his vintage gear to experience the “good old days” as we went for a burn aboard his fleet of vintage buggies. But unlike those old one-piece suits, the new Monosuit is incredibly comfortable. After a day in the Maverick version we can honestly say it offers all the new tech of a traditional two-piece suit, with full-range of motion, comfort, and good looks. What’s more, it could very well be the perfect gear for those extremely cold days, when you’re looking to seal out Old Man Winter. The Monosuit does a better job of keeping body heat in, while still delivering good breath-ability. The kids at FXR offer insulated and un-insulated versions and they also feature an inner suspender system to keep the suit “in-place”. Check em out for yourself at FXR Monosuit.